TOKYO -- Takata Corp. raised provisions for its airbag recalls that involve more than a dozen auto manufacturers, after denying reports that the biggest safety crisis in the industry’s history will expand further. The auto parts supplier will book a combined 20.1 billion yen ($189 million) in charges, 16.6 billion of which was decided after reviewing airbag recall costs, according to a statement on Monday. The remaining 3.5 billion yen is related to settlements with consumers injured by the devices. Takata shares plunged by the most in a month, after the Nikkei newspaper reported that U.S. regulators plan to call for expanded recalls. The shares fell 9.2 percent to 373 yen at the close in Tokyo, dropping its market capitalization to about 31 billion yen. The National Highway Traffic Safety Administration has told carmakers that recalls will widen to all vehicles with airbags lacking a moisture-absorbing desiccant that keeps the devices from deteriorating, the Nikkei reported Saturday, citing unidentified sources. There are more than 100 million such vehicles worldwide, the newspaper said. 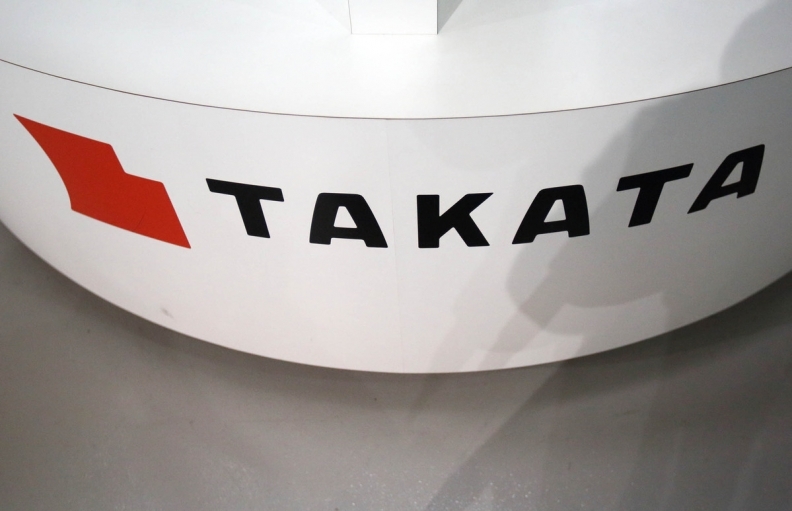 No decision has been made on expanding U.S. recalls and Takata is in talks with NHTSA, the company said in an earlier statement Monday. The airbag maker has lost more than half of its value this year. Takata inflators that can deploy too forcefully, rupture and spray plastic and metal shards at vehicle occupants have already prompted more than a dozen auto manufacturers to recall at least 60 million airbags worldwide. The defective components are linked to the deaths of 10 motorists in the U.S. and a pregnant woman in Malaysia in 2014. A fatal accident involving a Honda Civic driver in India last year also is under investigation. A researcher hired by a coalition of automakers said in February that moisture seeping into Takata’s inflators was determined to be the reason the airbags may rupture. Several other investigations are still underway, and challenges with determining root cause have held back automakers and the supplier from deciding how the companies will divvy costs. So far, most of those costs have been borne by automakers including Honda Motor Co., Toyota Motor Corp., and Ford Motor Co., whose cars are fitted with Takata airbag modules. Many automakers have said they will stop using the company's inflators in future models. The parts maker has been widely criticized for dragging its feet in identifying airbag inflators that needed to be recalled, and for providing incomplete and inaccurate data to authorities and automakers. The latest charges for Takata don’t include costs related to recalls that are still under investigation, according to the statement. The company said it had already booked 2.6 billion yen in settlements during the nine-month period ended in December. The company is scheduled to report earnings for the fiscal year ended in March on May 11. Takata has estimated cash and equivalents may drop 24 percent to 49.7 billion yen by the end of March 2017 if recalls continue at the current pace, a person familiar with the matter said last month. The supplier is seeking sponsors that would replenish its capital and allow it to emerge as a new company, said the person, who asked not to be identified because the internal forecast and search are confidential.